A skillet supper implies several things to me; comfort, warmth, ease, and speed. In the fall and winter months, especially, this is what we’re looking for, isn’t it? Aside from large holiday dinners, we most often want delicious meals that feature our favorite ingredients, but that are simple to prepare and don’t take lots of time. I think you’ll find that this recipe will give you that, and you’ll love that you can customize it with your favorite winter vegetables. 1. In a large cast iron or stainless steel skillet with deep sides, warm oil over medium – high heat. 2. Season chicken thighs with salt and pepper (or use your favorite seasoning blend), and then place in oil in skillet. 3. Cook the chicken on each side for 3-4 minutes, until nicely browned, no longer pink in center, and all juices run clear. Remove to a plate. 4. Add the cubed squash to the pan, and cook for 4 minutes, stirring frequently. Add mushrooms to the pan, and continue cooking and stirring for about six minutes. Taste a piece of squash. When done enough to eat, it will be creamy in the center but still hold its shape. Add salt, if needed. 5. Combine 1/2 cup broth and the vinegar, and add to the pan. Stir. Nestle the chicken down into the vegetables. Cover, lower heat to medium-low, and allow to cook together for 5 more minutes. Divide mixture among plates or shallow bowls, and serve with crusty garlic bread and a green vegetable, like deliciously-seasoned green beans. 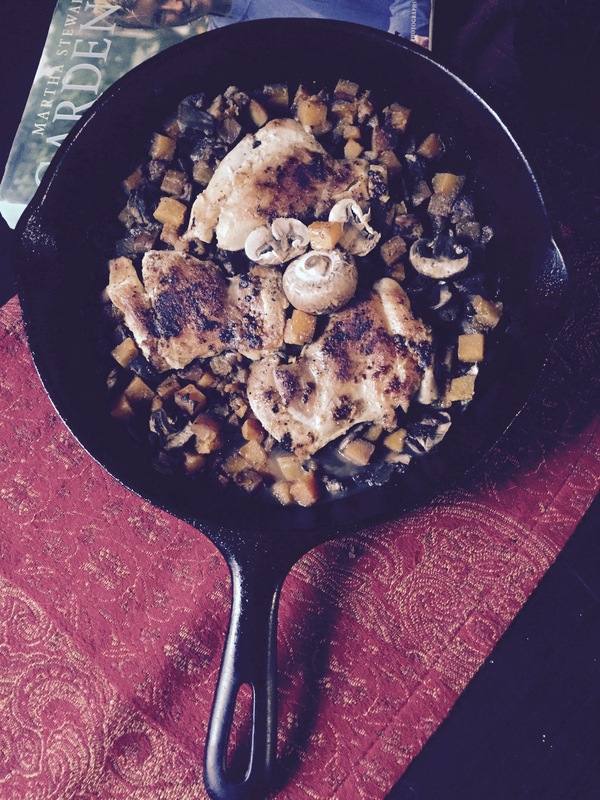 I hope you’ll try this simple skillet meal this week! It’s easy, as you’re letting the pan do all the work, especially if you buy pre-cubed squash. The produce section at Walmart always has it, so I imagine most stores do, especially in the fall. Great substitutes for butternut squash would be acorn or delicata squash, if you can’t get your hands on butternut or don’t like it. Yum yum yum!! It looks amazing!